Enjoy your Casino Veritas website visit. 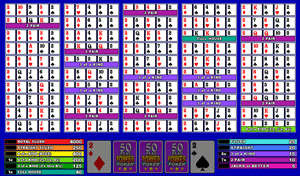 Bonus Poker 50 Play Power Poker is different from standard Video Poker as you play 50 hands of cards at the same time. There are no wild cards and the maximum payout is 4,000 coins per hand.